All previous barrow investigations in Norfolk of the 19th and 20th centuries are listed, and the finds from those unpublished sites briefly described. 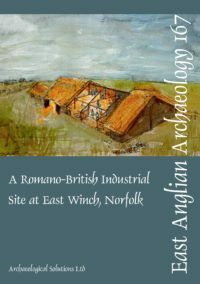 Excavations of barrows and ring-ditches, reported in this volume, include Little Cressingham; Sweet Briar Road, Norwich; Bowthorpe; Eaton Heath; Gallows Hill, Thetford; and Weasenham. (All except Thetford were of Early Bronze Age date). There are also brief notes on other sites at Bridgham, Cockley Cley, Garboldisham and Old Hunstanton. Several of these barrows consisted of two or more phases, indicated by successive ring-ditches. Several had traces of earlier occupation beneath, mainly pottery scatters. The ring-ditch at Bowthorpe had a central inhumation in a coffin, possibly designed to represent a log boat, and there were several inhumations in coffins in the surrounding ditch. The two mounds at Weasenham had cremations in situ, and the ring-ditch at Sweet Briar Road had a scatter of cremation material. A radiocarbon date for the mound at Gallows Hill suggests that it was constructed early in the 1st millennium AD but its original function is unknown. Ample evidence was found for its use as the site of a gallows in post-medieval times. 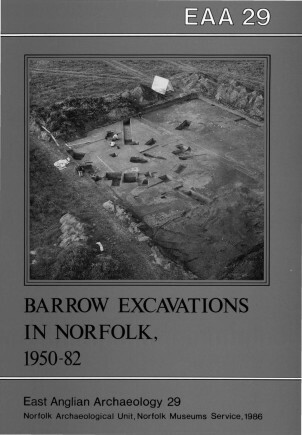 The book concludes with a review of recent discoveries of ring-ditches and barrows in Norfolk, made since the publication of EAA 12 in 1981.